medium rotation ⟳: Daily Nugget #11: Janelle Monáe, "Wondaland"
Daily Nugget #11: Janelle Monáe, "Wondaland"
I only occasionally leave the sound cave for sustenance and/or diversion, so bumping into new music the old-fashioned way, i.e., hearing it on the radio, happens somewhat infrequently. But in one of those too few serendipitous moments, I heard this track and immediately needed to know whodunnit. 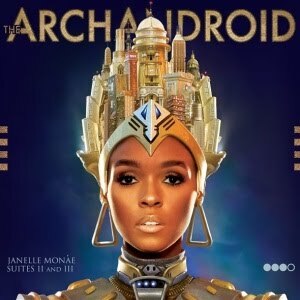 I have been reading about Janelle Monáe's The ArchAndroid (Suites II and III) and was planning on checking out her music; well, I think I may have found my Summer Jam '10. It's relentlessly catchy and fun, and the lyrics mention droids, secret Santas, fairygods, and underpants. In other words, resistance is futile. I don't see it. painful. it's like being trapped in a bollywood film. You see, I don't even know what kind of music this is; I would buy the album based on the cover art in an instant. Yes, I have fallen for this trap many a time! Cool drawings get me EVERY time!! I'm not sure this is a drawing, or even cover art—I'd like to believe that is what she looks like. Daily Nugget #8: Destroyer, "The Music Lovers"
Cover Your Tracks: Taj Mahal, "Take A Giant Step"
Daily Nugget #6: Pop Levi, "Blue Honey"
Daily Nugget #5: Wimple Winch, "Marmalade Hair"
Daily Nugget #3: Gold Panda, "Quitter's Raga"
Daily Nugget #1: The Grateful Dead, "Ripple"